Supermarket chains offer docket discounts on fuel which most of us are aware of, however, there are many other money saving opportunities on the bottom and rear of your receipt. Do you ever look at your grocery shopping docket to see what local discounts might be available to use at nearby venues? 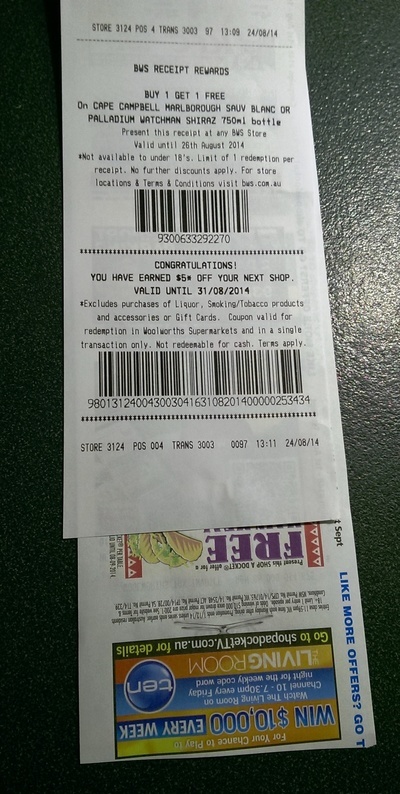 Woolworths currently offer 2-for-1 deals for BWS on the bottom of their dockets. 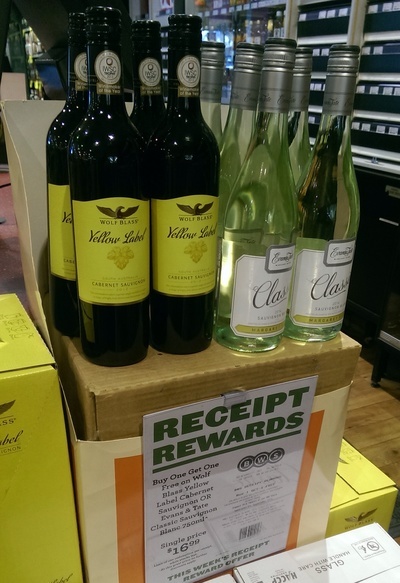 Usually, this promotion would be to buy a bottle of a particular wine mentioned on the voucher (a pick of either a white or a red), and receive another bottle free. There has been talk of banning such alcohol promotions, but at this stage, that hasn't happened. 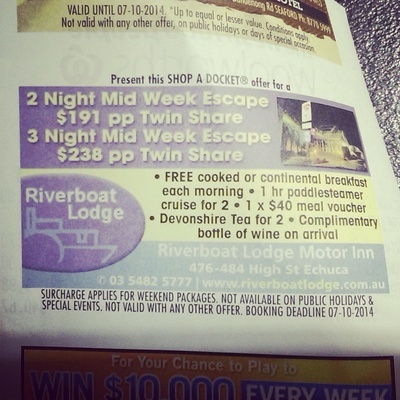 Some folk prefer a certain wine that is not promoted in docket deals, therefore wouldn't welcome this type of offer. But, if you like to try new wines, Woolworths/BWS promotions work well. Why not take advantage of a 2-for-1 offer and give one bottle away as a gift? Secondly, on the rear of supermarket dockets you will find a whole range of docket deals to be used at local businesses. I recently used a coupon to receive a meal for $6 at a local restaurant when buying another full priced meal. For a family or couple dining out, this is a huge saving and well worth taking advantage of. Other money off vouchers include discounts on dry cleaning, pizza deliveries, cafes, airport parking, travel, tours and more. Take a look at your receipt next time you go shopping at your local supermarket and you might find a docket deal worth taking advantage of too.